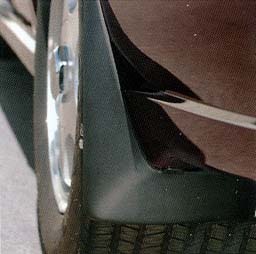 Impala splash guards look great while helping protect your vehicle from mud, dirt, snow, salt and gravel. Designed to be flexible but with a firm fit, the guards will not chip, crack or tear and will withstand extreme temperatures. Molded splash guards are made of a high-grade polypropylene with rubber reinforcements to protect your tires and body paint. Packaged in pairs.